Summer is almost upon us and a young man (or woman’s) thoughts inevitably turn to… new summer kit. In this instance, summer jerseys. 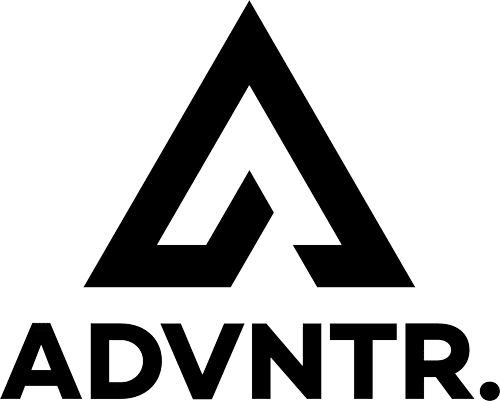 I have selected three shirts from three distinct price bands and will assess them for style, quality, value for money, effectiveness and protection. For the record, I have worn all three jerseys with and without base layers. I have tried to ensure that test conditions have been as hot as possible, well as hot as it gets in East Anglia anyway. 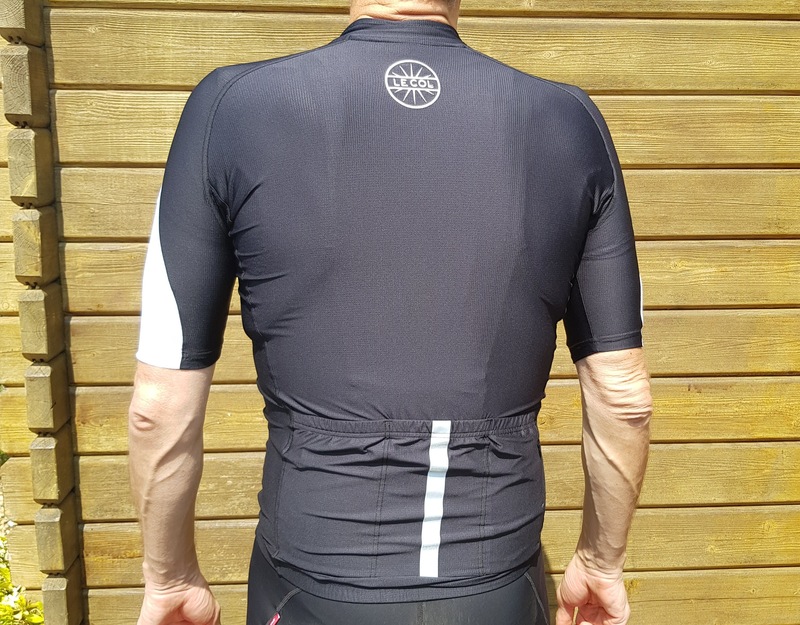 All three garments claim to use technical material to wick moisture away from the body, leaving the rider cool and dry so I’ll be looking closely to see how well they perform this basic, yet essential, function. This is worth discussing in a little detail. 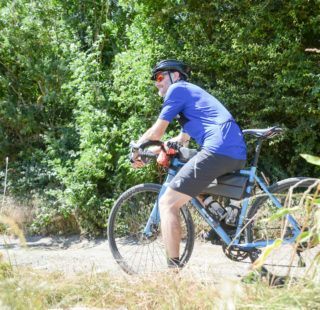 Long and ultra distance cyclists will spend hours in the saddle. If it is warm, they may be tempted to wear as little as possible and will be vulnerable to sunburn. 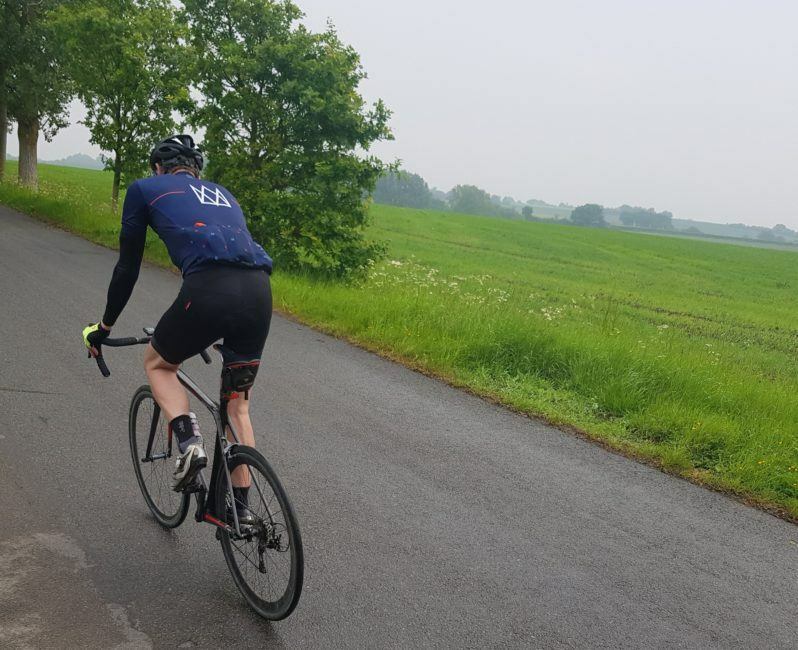 You don’t have to have too long a memory to recall the photographs of Louis Meintjes’ dreadfully burned back last year or indeed, Chris Froome’s burns in 2014. This makes the question of protection from the sun quite important. Some shirts claim UPFV protection, while others don’t. If the sun is strong, this has to be an important factor if you are to avoid burning and potentially more severe, long term, consequences. A short sleeved jersey with a full length zip. The material is a rich, royal blue with white arms and pockets. The blue really is the colour you see on the website. It is very distinctive. I wondered how noticeable the shirt would be from the back but I needn’t have worried. The white pockets stand out a mile, contrasting sharply with the blue. On the down side, they will get grubby with continued riding in the wet, or the dust, but probably not enough to compromise visibility. A low cut collar shows how the garment has been designed for hot weather use. If I have one issue, from a stylistic perspective, it is with the zip. A full length, white, zip just stands out a mile. It doesn’t look right to me. Furthermore, the zip doesn’t sit particularly well and can look a bit messy. The shirt has an ‘athletic’ cut so if you are carrying a few extra pounds, it might show! Galibier have not skimped on technical material. They claim to have used six different fabrics in the construction of the shirt. The side panels are Italian, Airmesh and the arms are of a ribbed fabric by Miit. The back of the shirt has silicone gripper. There are supposed to be grippers in the arms too (according to the website) but I can’t find them. Likewise, there are supposed to be reflective panels but again, they have eluded me thus far. Notwithstanding the absence of grippers in the arms, they stay in place and haven’t ridden up at all. Compared to the other two shirts, the internal stitching is a little untidy and the seams are messy. And that zip…it is only single stitched and the edges can be irritating on the skin when they fold in on themselves. At £39.00 this shirt is priced about right. You can’t make a direct comparison to garments costing two and three times as much. As a budget shirt it is spot on. 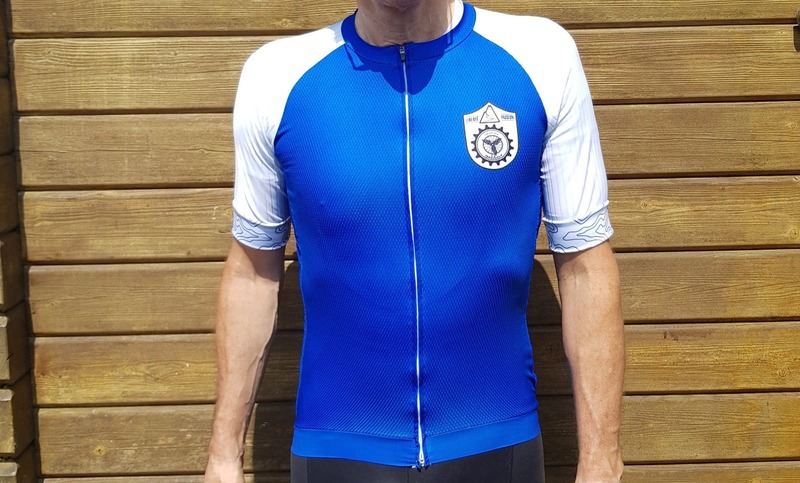 Both with and without a base layer, this jersey has kept me dry, well as dry as you can be kept when you are working hard. I have no complaints about the materials used or the way they work. 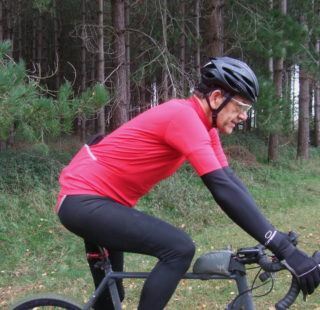 I have written to Galibier about sun protection ratings but have not had a reply. If they do update me, I will amend this review. If you ride a Mason, this is going to be bob on. If you aren’t a Mason fan, then maybe this isn’t going to be for you. All is not lost however. The shirt is based on the Morvelo Nth collection so there will be a fair amount of crossover between the two. A common theme with all the shirts here is that the cut is ‘athletic’. If I have one criticism with the style is that the pockets seem to be too high up the back. It is just a little too awkward to get stuff in and out without going into contortions. The zip is easy to use and undoes on the fly, with ease. When it is done up, the zip sits flat with no strange curves around the midriff. There is no zip park at the collar. I have become used to these recently, and the absence of this handy little flap of material is noticeable. Once again, we have a European fabric. This time it is Spanish Dual Dri-Clim® apparently. Whatever it is called, the front panels are close woven while the rear panels are of a mesh construction. It also works jolly well. There is a silicon gripper on the seams of the rear panels while the front is elasticated and slightly gathered. It all performs pretty much as expected. The seams are double stitched and flatlocked to reduce irritation. The sleeves feature silicone grippers. The ends of the sleeves are laser cut. This is an important factor if you want to cultivate razor sharp tan lines. To assist you in your summer goal, the grippers grip well enough and the sleeves stay put even during the most energetic of rides. This shirt claims to have reflective details. It does…but they are only details. I doubt whether they are large enough to be noticed if you are still out at dusk or if your ride has extended to the night time. At the £90.00 mark, there is plenty of competition. This is a fairly well populated segment of the market so whatever you dish up had better be good. For Mason fans, if you want to fly the flag, this is the only way to do it. Looking beyond the branding and assessing the shirt as a generic garment, it is pretty much on a par with other shirts in the price range. I like it, but there is nothing that makes it really stand out. 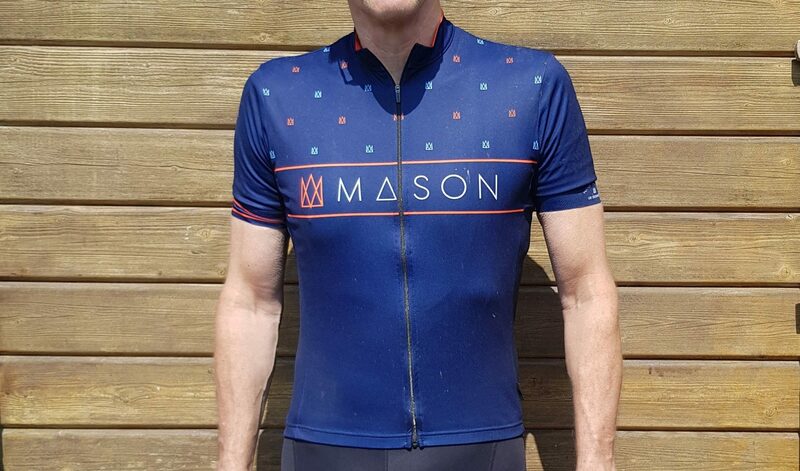 The Mason Format / Morvelo ‘Nth Series’ jersey experiencing standard British Summertime. It does what it says on the tin! It wicks moisture away pretty effectively, even on the small of the back. 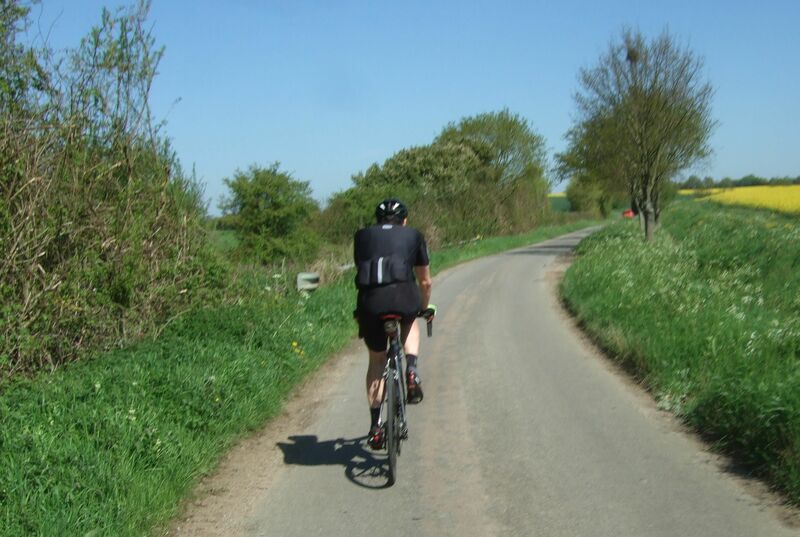 When your pockets are full, the sun is hot and you are riding hard, moisture can accumulate and become uncomfortable. Not so with this shirt, so in summary it works pretty well. As one might expect from Spanish fabric, the shirt has a Sun Protection 50 rating. 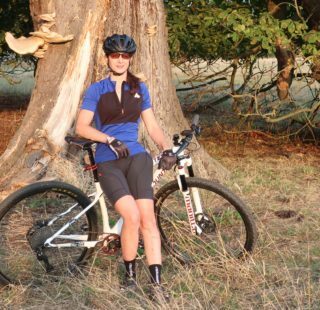 You won’t have to use sun cream or don a base layer to keep the sun off your pale bits. Described as Le Col’s ‘premium climbing jersey’, this is by far the most expensive garment here. To be honest, at first I was struggling to justify the price. How on earth can you spend that sort of money on a jersey? Once I had worked through my fiscal resistance, curiosity got the better of me. What is it about this shirt that makes it so expensive? First thing I noticed was how light the jersey was. Secondly, how soft the fabric was compared to the other two shirts on review. I know this isn’t necessarily the sort of comment one might expect, but I only mention it because it made quite an impression on me. Alone among the three shirts on test, it fitted like a second skin. A regular riding buddy likened it to a skin suit. There difference in fit between this and almost any other shirt I have worn for a long time, was quite marked. The main panels are made of Rib Tek mesh. It is quite closely woven but hold it up to the light and you can see through it. There is silicone gripper running all the way round the hem. 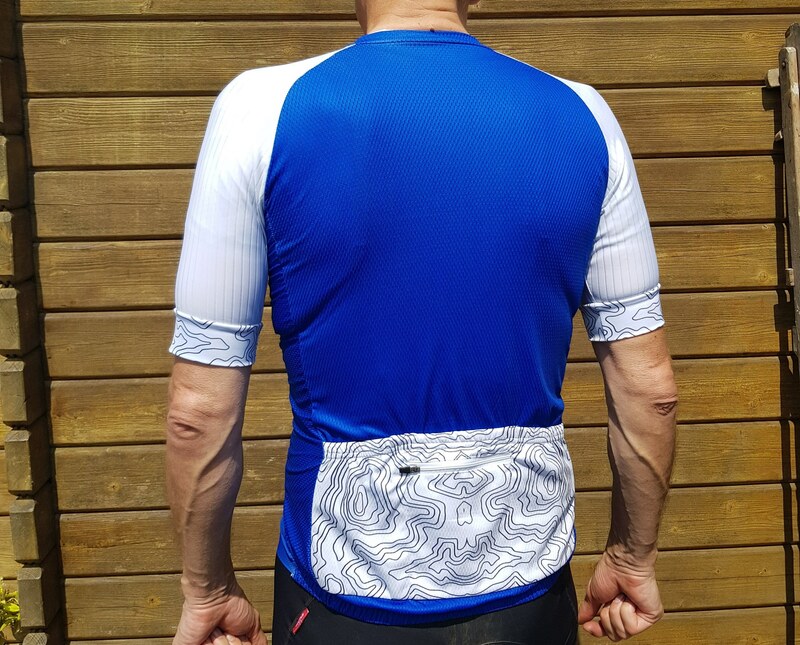 It keeps the shirt nicely in place so even if you are working hard for 100 miles or so, it doesn’t budge. The zip is easy to use and the tag is large enough to give you decent purchase while riding. oh yes, and there is a zip park too! The stand out feature for me is the ‘gummy gripper’ on the sleeves- the white sleeve panels in the picture. By making a whole panel from the fabric, not only does it avoid having a tight band around your arms, but it just holds the sleeve in place so well. I love it, what a good idea. The attention to detail when making this shirt is obvious when you look at the way the seams have been finished off. They have been stitched in such a way that they lie completely flat along the whole length of the panel(s). In most garments, the seams stand proud of the panel. Finally, the reflective detailing (a bold stripe up the central pocket) is large enough to be seen from a distance. While I am not, nor ever have been, a professional cyclist, this strikes me as a truly professional quality garment. There is nothing more I can add! My original cynicism disappeared on the first ride. 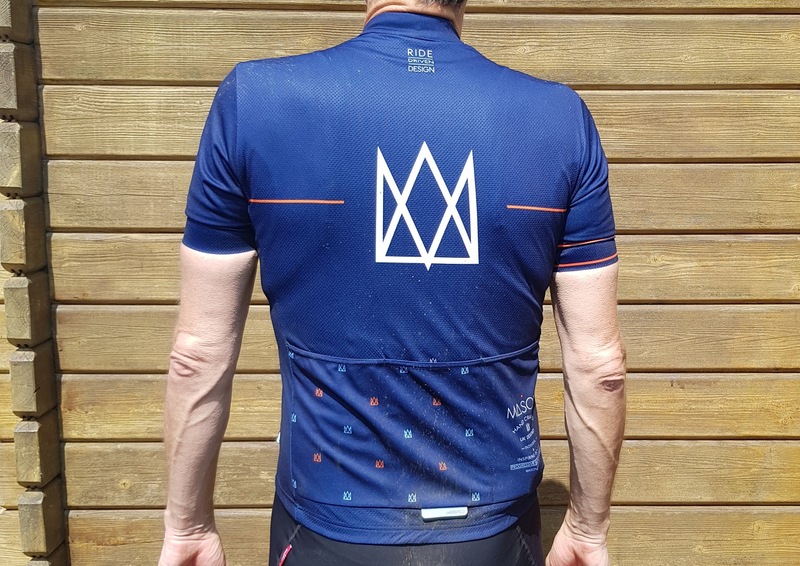 Sure, £150.00 is a lot to pay for a cycling shirt but once you start to examine it, you can see where the money has gone. Whether you want to shell out this sort of money is a moot point. I can’t honestly say it is ‘good value for money’ because that carries all sorts of connotations with it. If however, you are in the market for a truly premium product, then you will not be disappointed with this shirt. 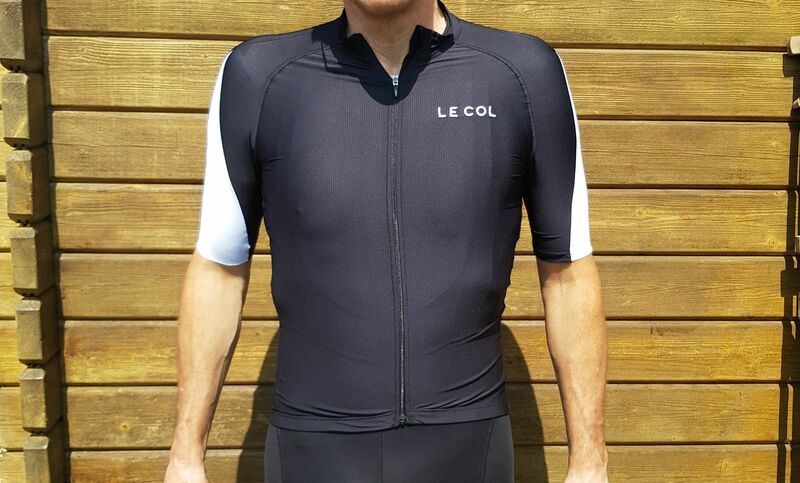 The Le Col jersey is a very understated piece in black. 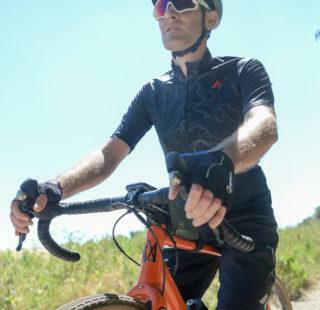 The HC Clima is designed for riding in the hottest weather. As such, it is too thin to have any UPFV protection. 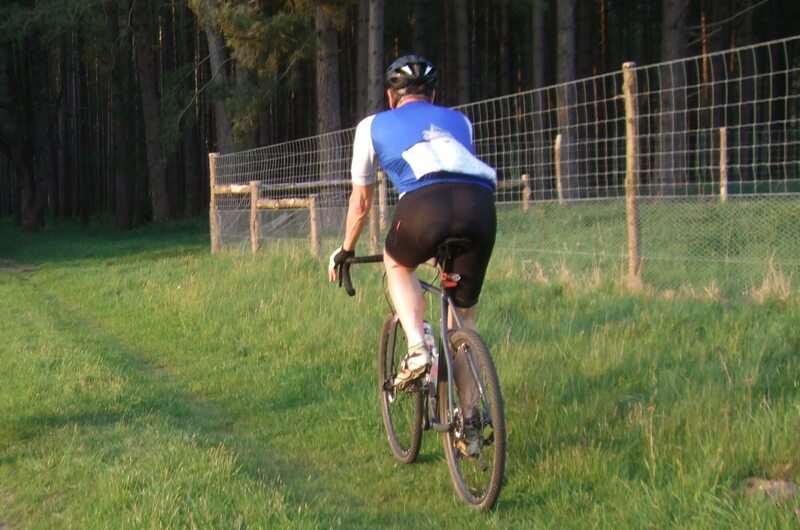 Le Col recommend wearing a base layer or using sun cream when the sun is out. They have also asked me to say that their HC, Pro and Sport ranges are rated to UPF 50+. The Clima and Air ranges have no such protection.